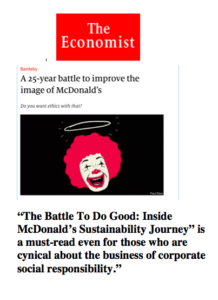 “The Battle To Do Good really deserves the attention and recognition of how important CSR is for businesses today. Today’s—and tomorrow’s—companies must address social and environmental priorities as part of the core business. For organizations that want to succeed in light of the issues rather than despite them, leaders must locate the intersection of doing good for society and helping its business prosper. By sharing the lessons learned from decades of front-line experience at McDonald’s, Bob Langert helps leaders do just that. The Battle To Do Good shows business leaders not only how—and why—to confront societal issues, but to embrace them in the knowledge that by doing good they can do well and help both their business and society prosper. Packed with real-world anecdotes and countless lessons learned, The Battle To Do Good provides keen insight and practical tips for managers of companies large and small as they navigate this increasingly complex, interconnected world where good news travels at the speed of light—and bad news travels even faster. Each chapter summarizes some “Hard Knock Lessons”–including insights into engaging with critics, crisis management, picking partners, playing offense vs. defense, and the 8 attributes of successful sustainable leaders. The Battle for Values: Can You Etch Them in Stone? The Battle to Make a Pig’s Life Better: How Much Room Does a Sow Need?